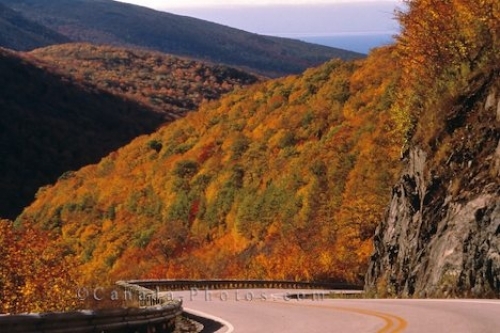 The landscape along the Cabot Trail in Cape Breton National Park in Nova Scotia changes into an amazing array of colours in autumn which makes the scenery along the drive absolutely gorgeous. The road along the Cabot Trail has been paved since 1961 and the park itself is home to six different campgrounds, twenty-seven hiking trails and an enormous amount of wildlife. Picture of the autumn colored landscape of the Cabot Trail in Cape Breton National Park in Nova Scotia, Canada.